Protrusio acetabuli is a disease in which deformity occurs in acetabulum medial wall. This deformity leads to migration of femoral bone head in to pelvic cavity. 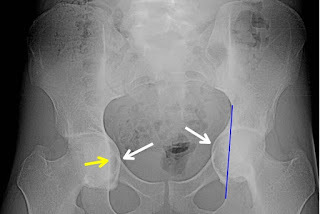 Due to this, patient feels pain in hip and the whole limb. Patient cannot move his limb properly. It is a congenital disease. It may be primary i.e. congenital and secondary i.e. acquired. There are 75 percent chances of congenital cause and 24 percent chances of acquired cause. Primary protrusio acetabuli may occur due to recurrent stretch fractures. It is common in middle aged women. Osteomalacia is considered the common cause behind protrusio acetabuli. It may involve both hips. Femoral head prosthesis leads to secondary protrusio acetabuli. It is divided into three forms on the basis of its severity i.e. mild, moderate and severe femoral bone deformity. According to the leading cause, treatment strategy is designed. It is an asymptomatic disease. Patient feels stiffness and pain in hips. Radiographic Imaging is performed to diagnose protrusio acetabuli. Diagnosis shows the attachment of femoral bone head to ilioishial line. This attachment is known as kohlers line. Head of femoral bone is medially attached to Kohler's line in diagnosis. Diagnostic reports show central edge angle more than 35 degrees which confirms protrusio acetabuli. Protrusio acetabuli is an asymptomatic disease. It limits the movement of limbs. It may involve sides of hips. Patient does not feel comfortable while walking. Severe pain may occur as a main symptom and can radiate towards upper back region. Limited joint movement and limb movement. Leg cannot be moved in all directions. If it is not treated on time, it may lead to complete limb immobility. These are the only symptoms shown by protrusio acetabuli. If it is secondary to any disease, then it occurs as a symptom of that leading cause. The most common cause reported is osteoarthritis. It has two main forms i.e. primary and secondary on the basis of its cause. Primary protrusio acetabuli which is also known as Otto pelvis is congenital. It commonly occurs in females. It may involve both sides of hips in some cases. The causative mechanism is not known. Whereas secondary protrusio acetabuli may occur as a result of some diseases like marfan syndrome, osteomalacia, Paget disease, rheumatoid arthritis, hip implants and central fraction dislocation. All these diseases can lead to femoral bone head protrusion in pelvic cavity. Surgery is the only treatment option for bone deformity because no medication can resolve bone deformity. However some pain medications are prescribed to relieve pain and for easy motion. OTC pain killers are mostly used. Vintogeno is the topical pain killer. Arthroplasty is performed in number but are little explored till yet. Usually bone grafting is performed. Joint replacement surgery is also performed to align joint position. The selection of type of surgery depends upon the age of patient and level of degenerative changes. Patient have to do some exercises to make their bone and muscle working.